← Does working increase the risk of miscarriage? Many women unfortunately have pain or bleeding in pregnancy – or attend for an ultrasound scan or assessment because they are anxious about their pregnancy. Often a scan is not conclusive – which naturally leads to even more anxiety. It is also known that early pregnancy problems can be associated with psychological morbidity. Being able to give an indication about the likely outcome is useful as this may prepare women for the most likely outcome when a scan is repeated at an interval. 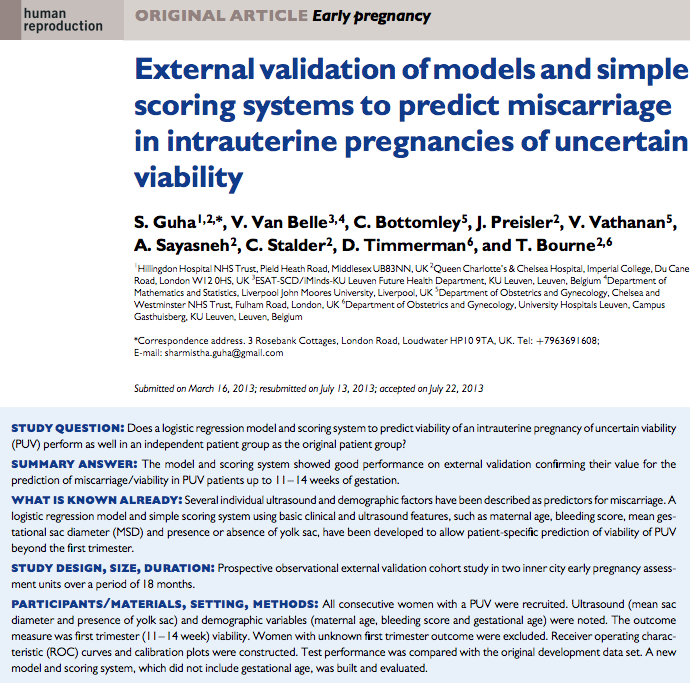 In a recent paper in Human Reproduction Guha et al have shown that a mathematical model or simple scoring system can give a very good indication of what will happen to a pregnancy. The prediction is made on the basis if simple ultrasound parameters, the amount of bleeding, and the gestational age of the pregnancy. Nobody wants to be in the uncertain situation where the health of an early pregnancy is uncertain – but at least this model can give clinicians an approach to counselling women about the likely outcome of a pregnancy. For women it must be hoped that this approach will help deal with the relative uncertainty associated with waiting for repeat scans before having a definitive diagnosis. 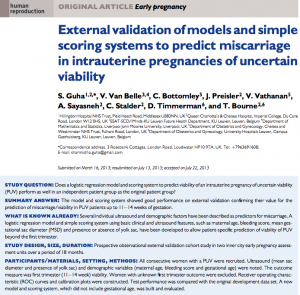 This entry was posted in Diagnosis, Diagnosis and treatment, Education, New research and tagged early pregnancy, Miscarriage, prediction model, Ultrasound. Bookmark the permalink.